1. Department of General Surgery (Breast and Thyroid Surgery), Shaoxing People's Hospital; Shaoxing Hospital, Zhejiang University School of Medicine, 312000, Zhejiang, China. 2. Department of Nephrology, Shaoxing People's Hospital; Shaoxing Hospital, Zhejiang University School of Medicine, 312000, Zhejiang, China. Purpose: Activated tumor-infiltrating fibroblasts were significantly associated with survival of cancer patients. However, they are heterogeneous population, and the prognostic role of these cells in human breast cancer still remains controversial. Herein, we performed the meta-analysis to better understand the role of these cells in prognosis prediction for breast cancer patients. Methods: We searched PubMed and EBSCO to identify the studies evaluating the association of intratumoral activated fibroblast density detected by immunohistochemical (IHC) method and overall survival (OS) and/or disease-free survival (DFS) in breast cancer patients, then computed extracted data into hazard ratios (HRs) for OS, DFS and clinicopathological features such as lymph node metastasis, TNM stage with STATA 12.0. 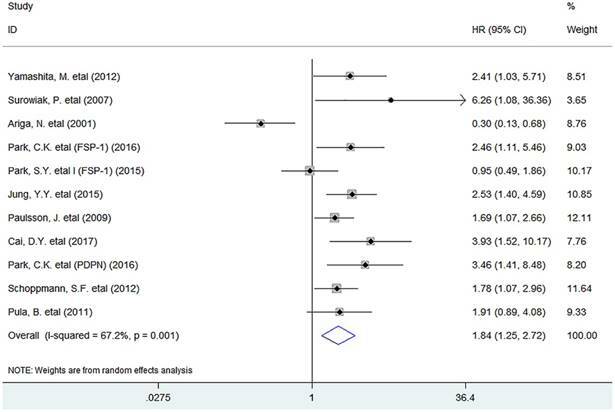 Results: A total of 3680 patients with breast cancer from 15 published studies were incorporated into this meta-analysis. We found that the infiltration of activated fibroblasts significantly decreased overall survival (OS) and disease-free survival (DFS) in patients. 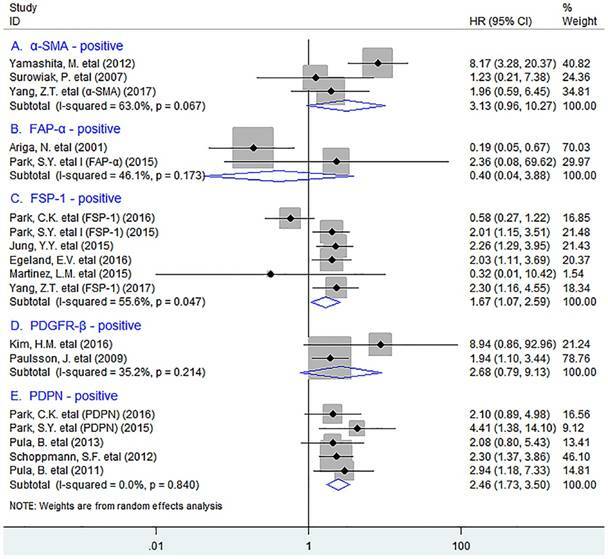 In stratified analyses, high density of FSP-1+ or podoplanin+ fibroblasts was significantly associated with worse OS; while α-SMA+ or podoplanin+ fibroblast infiltration was associated with worse DFS in breast cancer. In addition, elevated number of activated tumor-infiltrating fibroblasts significantly correlated with lymph node metastasis and poor tumor differentiation of patients. Conclusion: The infiltration of activated fibroblasts, especially the FSP-1+ or podoplanin+ fibroblasts leads to worse clinical outcome in breast cancer patients, implicating that it is a valuable prognostic biomarker and targeting it may have a potential for effective treatment. Breast cancer is the second leading cause of cancer-related deaths in females . Tumor microenvironment (TME) linked closely with the initiation, promotion, and progression of breast cancer . Fibroblasts, as the important component of the TME, are often activated by a multitude of stimuli including certain cytokines released by cancer cells . Multitudinous studies have demonstrated that activated tumor-infiltrating fibroblasts were significantly associated with survival of cancer patients. Although tumor-infiltrating fibroblasts are heterogeneous population, there are no highly specific markers to delineate potential heterogeneous subpopulations of them. Until recently, several markers such as alpha smooth muscle actin (α-SMA), fibroblast activation protein alpha (FAP-α), fibroblast-specific protein-1 (FSP-1) (also known as S100A4), platelet-derived growth factor beta receptor (PDGFR-β) and podoplanin (PDPN) have been used to identify the activated fibroblasts . Currently, depletion of activated fibroblasts has been utilized to restrain cancer including colon cancer in preclinical studies, yielding somewhat promising results [5-7]. However, in patients with breast cancer, discordant results have been reported concerning the prognostic value of activated fibroblast infiltration, which may play a negative [8-11], positive , or non-predictive [13-17] role in combating cancer. Thus, it needs in-depth assessment. Furthermore, the potential of these cells as a prognostic biomarker and targeted immunotherapy is essential to be explored. We performed this meta-analysis to clarify the association between the infiltration of activated fibroblasts and outcomes such as overall survival (OS) and disease-free survival (DFS) in breast cancer patients. PubMed and EBSCO were searched for studies to evaluate the density of tumor-infiltrating activated fibroblasts and survival in breast cancer patients from 1980 to April 30th 2018. The keywords adopted for search were (fibroblasts [Title/Abstract]) AND (breast [Title/Abstract] OR mammary [Title/Abstract]) AND (neoplasms [Title/Abstract] OR tumor [Title/Abstract] OR cancer [Title/Abstract] OR carcinoma [Title/Abstract]). 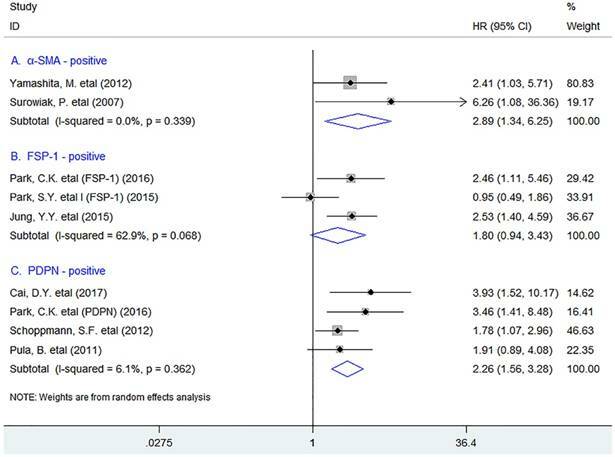 In this meta-analysis, the inclusion criteria were: studies must have (1) been published as original articles; (2) investigated breast cancer patients; (3) detected activated fibroblasts in primary tumor specimens with immunohistochemistry (IHC); (4) provided hazard ratios (HRs) with 95% confidence interval (CI), or Kaplan - Meier curves of high and low density of activated fibroblasts with OS, and/or DFS; (5) been published in English. The exclusion criteria were: studies (1) were not published as research articles or full texts including commentary, case report, letters to editors and conference abstracts; (2) didn't provide sufficient data to estimate HRs; (3) detected activated fibroblasts not with marker 'α-SMA' etc mentioned above, or in metastatic tissues. In this meta-analysis, we recorded OS and DFS as the primary and second endpoint respectively. OS was defined as the time from the date of the first curative operation to the date of the last follow-up, or death from any cause; while DFS was the time from the date of the first curative surgery to the date of the first loco-regional or systemic relapse, or death without any type of relapse. GM.H. and KF.Z. independently reviewed and extracted data such as first author's name, number of patients, median age, time of follow-up, method and markers used to quantify activated fibroblasts as well as cut-off value to define high density of these cells. OS, DFS and clinicopathological information including tumor, node, metastasis (TNM) stage and tumor differentiation etc were extracted from the text, tables, or Kaplan - Meier curves. Two independent authors evaluated the quality of included cohort studies with Newcastle-Ottawa Scale (NOS) , and achieved consensus for each item under the help of third author. A total score of 6 or more points was considered high quality. We combined extracted data into meta-analyses with STATA 12.0 analysis software (Stata Corporation, College Station, TX, USA). Statistical heterogeneity was assessed with the chi-squared based Q-test or I2 . Data were combined based on the random-effect model in the presence of heterogeneity , otherwise, the fixed-effect model was applied . Sensitivity analysis, Begg's funnel plot and Egger's test  were applied to probe the influence of each study on the pooled result and potential publication bias respectively. All P values were two-sided and less than 0.05 are considered statistically significant. 11317 records were retrieved and the results were exhibited in Fig. S1. We ultimately identified 15 studies containing 3680 breast cancer patients for the assessment of activated fibroblasts [8-17, 23-27], and then evaluated all these studies with the Newcastle-Ottawa Scale (NOS). Characteristics of included studies being in accordance with the inclusion criteria and suitable for data consolidation were shown in Table 1 and Table S1. 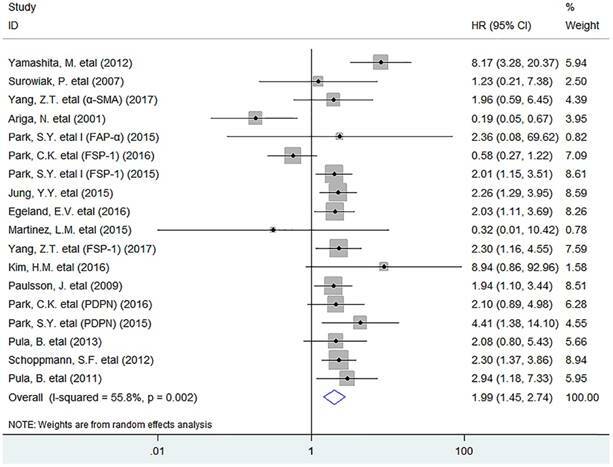 In this meta-analysis, the pooled result indicated that activated fibroblast infiltration significantly decreased OS (HR = 1.99, 95% CI 1.45 to 2.74, P < 0.001) in breast cancer patients (Fig. 1). In stratified analyses by different subsets of tumor-infiltrating fibroblasts, as shown in Fig. 2, pooled results showed that high density of tumor-infiltrating FSP-1+ fibroblasts was significantly associated with worse OS in patients (HR = 1.67, 95% CI 1.07 to 2.59, P = 0.023); Similar result was observed between PDPN+ fibroblast infiltration and OS in breast cancer (HR = 2.46, 95% CI 1.44 to 2.76, P < 0.001), with no heterogeneity being detected (I2 = 0.0%, P = 0.840). However, there was no significant association between the infiltration of α-SMA+ fibroblasts (HR = 3.13, 95% CI 0.96 to 10.27, P = 0.059), or FAP-α+ fibroblasts (HR = 0.40, 95% CI 0.04 to 3.88, P = 0.433) or PDGFR-β+ fibroblasts (HR = 2.68, 95% CI 0.79 to 9.13, P = 0.114) and OS in patients. Meta-analysis showed that the infiltration of activated fibroblasts was significantly associated with decreased DFS (HR = 1.84, 95% CI 1.25 to 2.72, P = 0.002) in human breast cancer (Fig. 3). In stratified analyses, we found that increased density of tumor-infiltrating α-SMA+ fibroblasts was significantly associated with worse DFS in breast cancer (HR = 2.89, 95% CI 1.34 to 6.25, P = 0.007), with no heterogeneity existing among included studies (I2 = 0.0%, P = 0.339). Similar result was observed between PDPN+ fibroblast infiltration and DFS in patients (HR = 2.26, 95% CI 1.56 to 3.28, P < 0.001). Nevertheless, there was no significant association between FSP-1+ fibroblast infiltration and DFS (HR = 1.80, 95% CI 0.94 to 3.43, P = 0.074) in breast cancer patients (Fig. 4). In addition, we found that increased density of these cells was significantly associated with clinicopathological features such as lymph node metastasis (OR = 1.43, 95% CI 1.02 to 2.00, P = 0.036), poor tumor differentiation (OR = 0.35, 95% CI 0.20 to 0.62, P < 0.001) and negative estrogen receptor (ER) status (OR = 0.59, 95% CI 0.39 to 0.88, P = 0.009), but not with TNM stage (OR = 0.88, 95% CI 0.48 to 1.63, P = 0.690) of patients (Fig. S2). Sensitivity analysis indicated that each included study had no influence on the overall HR for OS or DFS. There was no publication bias existing between activated tumor-infiltrating fibroblasts and OS (P = 0.596) or DFS (P = 0.795) in patients by Funnel plot and Egger's test. Main characteristics of the included studies. Forest plots describing HR of the association between activated fibroblast infiltration and OS in breast cancer patients. Stratified analyses describing HRs of the association between the infiltration of different subpopulations of activated fibroblasts and OS. Forest plots describing HR of the association between activated fibroblast infiltration and DFS in breast cancer patients. Stratified analyses describing HRs of the association between the infiltration of different subpopulations of activated fibroblasts and DFS. Fibroblasts are traditionally implicated and well recognized in wound healing and tissue fibrosis. In the past decades, although many studies have correlated activated tumor-infiltrating fibroblasts and prognosis of breast cancer patients, their results were not consistent even controversial. In the present meta-analysis, we found that the infiltration of activated fibroblasts, especially the FSP-1+ or PDPN+ fibroblasts had a negative prognostic effect associated with survival in breast cancer. In addition, increased density of activated fibroblasts was significantly associated with lymph node metastasis and poor tumor differentiation of breast cancer. Hence, we think these findings provide meaningful statistical evidence to exhibit the negative prognostic role of these cells in breast cancer patients. The following reasons could possibly be responsible for the close association between increased activated tumor-infiltrating fibroblasts and decreased survival of patients presented in this study: Activated fibroblasts are able to promote tumor cell invasion, proliferation and survival through releasing growth factors, cytokines , and extracellular matrix (ECM)-degrading proteases such as matrix metalloproteinases (MMPs) . These cells can synthesize and release angiogenic factors including IL-8 and TNF-α as well as VEGF which promote neoangiogenesis thereby facilitating tumor growth. In addition, they can also produce amount of immunosuppressive cytokines such as TGF-β1, IL-6 and IL-10 to inhibit antitumor immunity mediated by effector T cells , recruit tumor-associated macrophages (TAMs) via CCL2 secretion, and decrease the activation of effector T cells through their acquisition of adhesion molecules such as intercellular adhesion molecule -1 (ICAM-1)  thereby establishing immunosuppressive microenvironment. Thus, it is reasonable to conclude that the activated tumor-infiltrating fibroblasts are able to promote tumor progression thereby decreasing survival. Some markers such as α-SMA, FAP-α and FSP-1 are considered to the specific markers, especially α-SMA is the most wildly used to identify the activated fibroblasts; whereas PDGFR-β and PDPN are the non-specific markers as they are also expressed in other cells including endotheliocytes . Interestingly, different activated markers on fibroblasts are deemed to exhibit differential and unique significance in clinical practice. For instance, FAP-α+ fibroblasts have been thought to be involved in modulation of ECM and tumor cell invasion through increasing levels of fibronectin and collagen fiber organization ; while PDGFR-β+ fibroblasts were shown to be associated with metastastic spread and high interstitial fluid pressure [34, 35], and FSP-1+ fibroblasts promote metastastic colonization through VEGF-A production , and protection from carcinogens . In addition, PDPN expressed in fibroblasts can enhance the ability of these cells to promote motility and survival of neighboring tumor cells through increased RhoA activity ; whereas the specific function of α-SMA+ fibroblasts needs further investigation. There were several limitations in this study. First, morphometric analyses for activated fibroblasts used in individual included studies were not consistent. In addition, studies with negative results may not be published, which may cause potential publication bias. In conclusion, the infiltration of activated fibroblasts, especially the FSP-1+ or podoplanin+ fibroblasts leads to an unfavorable clinical outcome in breast cancer patients, implicating that it is an effective prognostic biomarker and targeting it may be the novel therapeutic strategy for these patients. OS: overall survival; DFS: disease-free survival; HR: hazard ratio; OR: odds ratios; Cl: confidence interval; α-SMA: alpha smooth muscle actin; FAP-α: fibroblast activation protein alpha; FSP-1: fibroblast-specific protein-1; PDGFR-β: platelet-derived growth factor beta receptor; PDPN: podoplanin; IHC: immunohistochemistry; TNM: tumor, node, metastasis; TME: tumor microenvironment; ER: estrogen receptor; ECM: extracellular matrix; NR: not reported; HPF: high power field. We thank all the members of the departments who helped in this study. This work was supported by the National Natural Science Foundation of China (Grant No. 81702803, GMH). This work was also granted from the project of Zhejiang Province Scientific Research Foundation of Traditional Chinese Medicine (Grant No. 2017ZB089, LMH) and Science and Technology Innovation Project of Shaoxing Health and Family Planning Program (Grant No. 2016CX002, WC). GM.H. conceived of the study, participated in its design, extracted data, performed the statistical analysis and drafted the manuscript. KF.Z. participated in data extraction. F.X. and SM.W. participated in the statistical analysis. LM.H. and W.C. participated in the design of the study. All authors read and approved the final manuscript. Corresponding authors: Guoming Hu: E-mail: hgmpljcom; Liming Huang: E-mail: shaoxinghlmcom; Wei Chen: E-mail: cwzjsx5018com.